The future of comic books? Digital for sure but… will Marvel, DC & other multinationals transform their Amazing Spideys, Supermen and 1001 creature publications into interactive stories? You may have iOS & Android apps but besides a few games or dedicated-superhero apps none of the weekly published comics are interactive or motion-based comics. They still have their charm and succeed to engage however… it’s all about the story in the end. 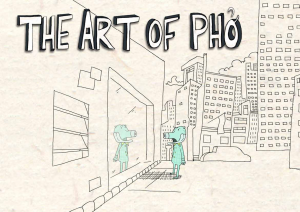 What The Submarine Channel have managed to do this time is not only adapt a great story but launch a highly engaging web-comic based on British animator Julian Hanshaw’s “The Art of Pho“. Under his creative supervision and with animation director Lois van Baarle, Submarine Channel adapted The Art of Pho for the web by adding the dimensions of sound, music, animation and interactivity. The website includes all 8 episodes (the next 4 being unveiled this week) and also contains extra info such as the making of with interviews with illustrator/animator Hanshaw and Lois van Baarle. Submarine Channel describe it as a “deliciously surreal interactive motion comic“ telling the story of Little Blue and his friends. This creature ends up in Ho Chi Minh City (Saigon) where he learns to master the Art of making Pho (Phở) – Vietnam‘s ubiquitus noodle soup. So whenever you feel like a new adventure, or simply a great way to learn how to cook Pho you can go for the traditional printed edition or this great piece of interactive animation with soundtrack by Pastelle Music.